Anything goes this week at Sweet Stamps. I stamped and colored this beautiful Gold Finch with the pretty little flowers. I used the pretty Polynesian sails frame behind the birds. I added the pretty corner Victorian Romance flourish. with the pretty daisy strip flower and rose leaf strip for both the cover and inside. It has been an honor to guest design for Sweet Stamps this month. Please check out the beautiful images and dies on the website. hi Karen, love this beautifully coloured image, what gorgeous dies you have used, I have these must use them again sometime. Hi Can't find where to link my anything goes atc for this weeks challenge. Karen- it was so nice having you as GDT for the month of May- thank you for joining us! I love your work- another fab card!!! 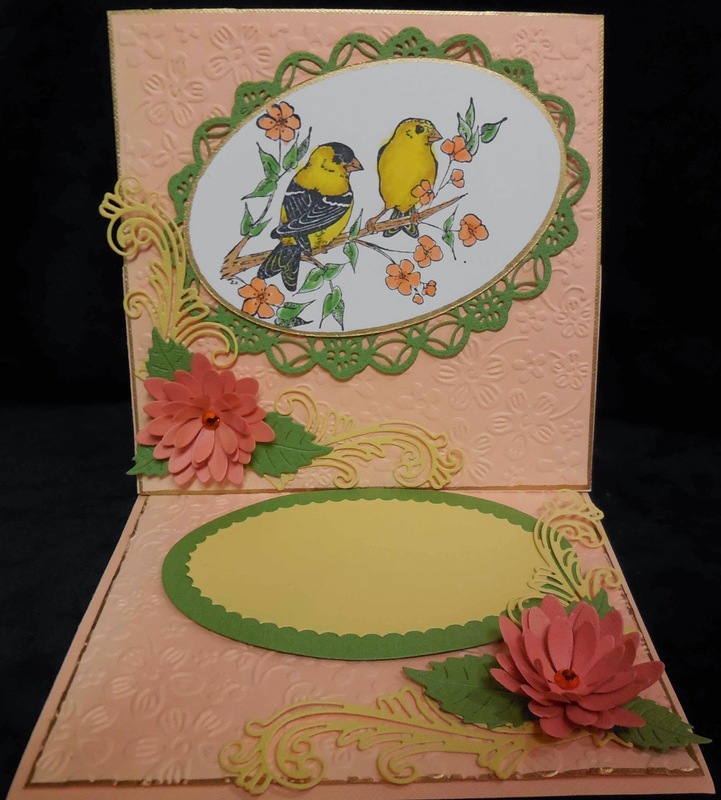 Beautiful coloring on the Gold Finch pair, love your design with the embossed background and wonderful flowers. Thanks again for sharing your designs with us this month. Love your card and the colours are beautiful...thanks for stopping by my blog and leaving such sweet sentiments. Thank you for sharing your beautiful creations with us this month, Karen. Your finches are so pretty. I really like the dies you used and those flowers are the perfect touch.